Evening Daniel, last time I spoke to Stevie just before your headline tour with Mollie Marriott last year. Having spoken to the voice of Bad Touch as Shake A Leg is launched to the world and the band is back on tour it will be great to talk to you the holder of the Rhythm guitar. DS: No problem looking forward to your questions! BD: Was the guitar always your instrument of choice and what inspired you to play the six strings? DS: No it wasn’t my first choice. I started on the drums. My Dad was a drummer so there was always kit around the house. I played but I just never gelled with them. There was a guitar laying around the house so I picked it up. This felt better I naturally picked up the guitar it was right handed so I was forced to learn to play right-handed. BD: You also provide vocals as well as guitar, Vocals, an integral part of you like having curly or straight hair. Whereas the guitar sound is created by the guitarist. What guitar do you play and what pick-ups create the Seeking sound. DS: My favourite is my Gibson Les Paul standard 2008 it is faded but only made a few years ago with standard pick-ups. I have played the guitar for ten years it has travelled with me. It has a few interesting battle scars. I have played it for a long time it is well used and part of my journey. Many people are surprised at the guitar’s age they think it is vintage as it looks older! BD: Bad Touch has a distinctive tone and the vibe is definitely heavily influenced by Southern Rock. What attracted you to Southern Rock? Was it always your intention to be in a band that plays Southern Rock? DS: Simple answer No. I have always been into rock, Guns N’ Roses got me and gave me the appetite to play. My influences and the bands have grown and with that my music tastes have grown. I love listening and enjoying vast varieties of different styles. 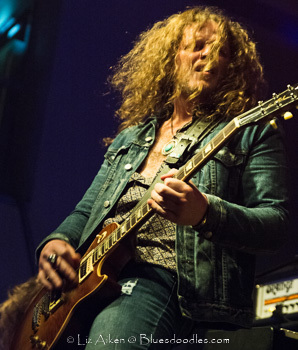 Southern Rock influences are the likes of Skynyrd and Marshall Tucker Band. We have toured with Kentucky Head Hunters we all love them they are great, really good guys. They are one of the best bands we have played with. They taught us a lot over such a short period we were touring with them. BD: All five of you have in input into writing the material for the album. How do you approach songwriting is it the lyrics or driven by the rhythms you conjure on the album. DS: Songwriting is always different. We don’t have a set way of writing. Sometimes lyrics first then the music other times melodies come first then the band add the lyrics. The band work together the songs are down to us being a band. We write as a band, there will be a basic idea form one of us and then we as a band pull it apart then rebuild and the outcome is always better with this group effort. BD: Bad Touch has two guitarists in the line-up once again you are joined by Rob Glendinning in the double guitar sound. How do you decide on the roles each of you are going to play on a number? DS: I have always played guitar in the rock bands I played in. Except for a short time, Rob has always played the lead in Bad Touch. Rob is a better guitar player, I didn’t start until I was 15 years old. Instantly I tried to form a band from High School onwards. We gel together it is natural how we work together. We have worked together for a long time and kinda know what each other are going to do. It is more important that together we create a sound that is good that is what is important. I do not have an ego where I have to be the leader of the pack, I want to play in a great band and this combination makes us a better band. BD: Shake A Leg is definitely catching reviewers and fans attention now that it has been released. Do you have a favourite track(s) and what makes them stand out? DS: Mmmm… I suppose I do – Slow Tempest it has a different feel with great harmonies, the whole song has a bit of everything from bongos to acoustic guitar it was fun to record and play. Hammer Falls is another favourite with its heavy rhythms and Southern vibes. I am really happy with I Belong. I wrote the song about where I come from and it has slide guitar in it as well. BD: Your latest album Shake A Leg, closes with Bury Me (When I’m Gone). How did you manage to make such a breathtaking and sad song so uplifting? DS: Bury Me we had that in the pipeline for the last album but never happy with the song first time round so it was never finished. This version Andy our producer tried just three of the band Rob, Steve and George. Played with feel that captured the sound really well. George sits back with shakers with the guitar and vocals. This way it really works. We have always tried different ways from Mountain closing our last album through to Slow Tempest which is something different again. DS: Following the release of the album you are back on tour in the UK with two bands as Special Guests: Aaron Buchanan & The Cult Classics and Daxx & Roxanne. Do you as a band decide who you are touring with? BD: One thing we do not have to worry about. It is not down to us. We have a booking agent who organizes the tours. That said we are really pleased to have two great support acts. We have to follow them so will be at the top of our game. BD: You will be on the road for a month from 17th October in Newcastle and finish in Bilston on the 19th November. How do you keep focused on the next nights gig another town and another motorway, how do you relax. DS: I love being on the road love being in a band in the studio as well but the road is the heart of Bad Touch. For a long time, we have been a live band. It is just natural that everything becomes bit of a blur with motorway services and hotels they merge into one. We chill out as much as possible when we can we see as much of the places we go to as we can. It is fun and I wouldn’t change anything. DS: Wow! There are so many gigs. So many are iconic. Definitely go back to Monsters of Rock, Donnington 1988 or Guns N’ Roses Live At The Ritz early footage was what I grew up with. Another great gig would have been The Tribute Concert to Freddie Mercury or go back with my Dad and share with him his experience of hearing Zep at Knebworth in 1979.